Byron: serving proper hamburgers, the way they should be. 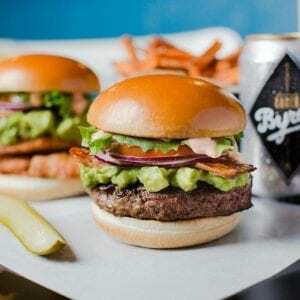 Founder of Byron Hamburgers Tom Byng discovered a love of hamburgers during a four-year stint in the USA. Late nights with friends often ended by indulging in this ultimate comfort food. On his return to the UK in 2007 he realised there was a gap in the market, and since that day they’ve sold millions of hamburgers across the UK. You can now enjoy an authentic American experience in Exeter. Its burgers are freshly made from properly-sourced British beef and the best ingredients possible. The menu features a wide selection of salads, sides and desserts and a great assortment of craft beers and milkshakes.